The compact grid of units lets you select a group member quickly, while keeping a good overview of the whole group. Grid is designed to show you only what you need to know, and not overload you with irrelevant information. It is highly configurable, letting you choose exactly what is shown, and how it's shown. There are also many plugins that add even more features! Do not use comments to report bugs or request features. Such comments will be deleted. Use the links above to post a ticket instead! Grid works in all languages. It is translated into English, Deutsch, Español, Français, Italiano, Português, Русский, 한국어, 简体中文, and 繁體中文. To add or update translations for any language, please enter them in the CurseForge localization system. New and updated translations will be automatically included in the next version of Grid! Grid was originally conceived and written by Maia and Pastamancer in late 2006. Phanx has been the primary developer since late 2009. Jerry wrote the original pet support code. Mikk designed the icon. 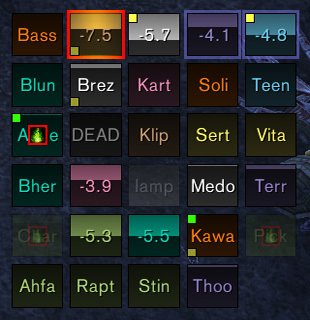 jlam added some advanced options for auras. Greltok and Stassart have helped a lot with bugfixing. Finally, lots of people have contributed translations! There's an issue with GridStatusRaidDebuff2 when you go to status, then raid debuffs and select a dungeon, and then load that dungeon. Some dungeons load, and others do not load. Freehold is an example of a dungeon debuff that when you manually load the debuffs doesn't display anything in the status area. The only way to get status functionality back is to reload UI, then try loading freehold again and it fails again and you have to load UI again. I this a GridStatusRaidDebuff2 or a Grid issue? Latest version loaded, joined a BG, got error listed below, Grid settings trashed, profiles missing - can't reload original settings, too much work to redo settings, bye bye Grid, hello Grid2. Can anyone help me with this- trying to see if I can get the debuff icons to show stacks- how can I do that. So I've a problem with Grid (or any of the grid related addons) that I would love to fix since I've been using grid since pretty much wotlk. I've Grid, GridIndicatorsDynamic, GridStatusDungeonDebuff, GridStatusExternals, GridStatusRaidDebuff and GridStatusRD_BfA installed. When doing 5-man content everything works fine but as soon as I join any kind of raid the game gets unplayable as it lags to much. Everything is sorted out when I disable the grid addons. The problem started to happen at some point during the end of Legion. Can't remember if it was the prelaunch when I downloaded the temporary solution for Grid that was posted here since it took so long for it to update. I've tried to delete all Grid addons in the addon folder then downloaded them again but the problem remains. Anyone had the same problem or know how to fix it? Ty in advance! 1. Is it possible in any way to display the current status of the WarMode(ON/OFF) for each member of the group/raid? 2. Is there any visual icon/mark that would tell me: am I currently a member of a group or a raid? (ofc, the question is relevant if the raid contains 5 or less people). 1x [ADDON_ACTION_BLOCKED] AddOn 'Grid' tried to call the protected function 'GridLayoutFrame:Hide()'. Can someone confirm that the new version resolves all the issues we had with the 8.0.1.0 version? I'm a bit hesitant to update! I updated this 4 days ago, everything is working fine to my knowledge. Is there a way to see new debuffs in the new dungeons for BFA? Why cant I see more than one group in raids?! I copied that text you wrote Poonzer and replaced it in Layouts.Lua. Still doesnt work. Anyone knows if a update is coming soon? Only shows 1 group in Brawl. Old version works and show all groups. I expect it's the same fix Poonzer is talking about in #100. It's just two lines in Layouts.lua, I was getting only 1 group showing up in an LFR, and that edit fixed it. I switched back to Attict's BFA version until this version fixes all the errors. Attict's version works flawlessly right now with no errors. Thank you for the BFA update, I didn't want to use another raid frame addon, so thanks for the update. Will post errors if I see anymore. Please update Grid. I've tried the github code, only WoW sees Grid as out of date, thus my addons for grid have a dependency disabled error. essentially Grid is broken, I despise VuhDoh, and Grid2 doesn't do what I would like. If it is still not working, try deleting it from your WoW folder, and downloading it again, from above link.